A glass staircase is causing women to rethink taking the stairs. For years, women across America have dealt with glass ceilings. But now, women in Ohio have a new problem - glass floors. Dress wearers need to avoid taking the stairs, according to Franklin County Judge Julie Lynch, who wears dresses under her robes almost every day. 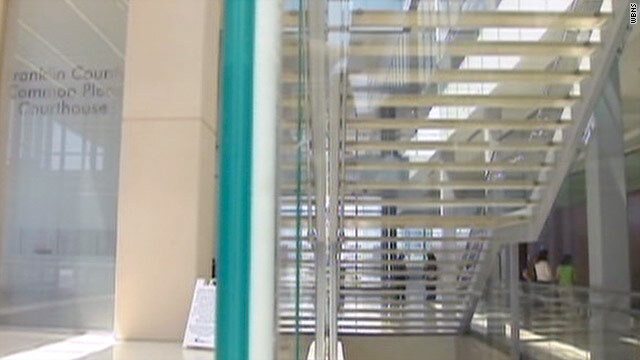 Attorney Lori Johnson was startled by the transparent stairs. She worries not only about stares, but also how many cell phones have cameras attached. While security guards warn women about taking the stairs, it seems most are just hoping people will be mature about the situation. "They hope people will be mature? That's not a solution," Lynch said to 10TV. "If we had mature people that didn't violate the law, we wouldn't have this building." Acid etch the glass – same idea as sandblasting, but a faster, easier way to accomplish frosting the glass. It's easy to do, makes the glass frosted so you can't see through it, it would be an inexpensive solution and light will still pass through keeping the integrity of the design; problem solved.